Ever since I was young, it seemed that no matter how bad I wanted it, certain sports just weren’t for me. As much as I love basketball, football, and other sports they just didn’t seem to fit. Plus, I was too small to play for teams by about high school anyway. At around 14 years of age, I tried boxing. I only tried it because it wasn’t a team sport necessarily and if I ever competed, size wouldn’t be a huge factor since there were weight classes, etc. Plus, I come from a family of Boxing fans. So I knew getting Pops’ support for his boy to learn how to fight wouldn’t be too tough. After a year or so in boxing, I started watching the UFC. One of the first fighters I really began to watch was BJ Penn. This guy was my height and only had a few pounds on me so I was curious to see how he faired in a fairly new form of combat that really intrigued me. Well, as many of you know, he was the UFC lightweight champion of the world and his specialty was his Brazilian Jiu Jitsu. Although I knew what BJJ was, I wasn’t too into it. I was convinced that striking was the only martial art you needed to survive in full fledged combat. However, every main event, I watched my favorite fighter (As well as many other grapplers) choke out some of the best strikers I’ve ever seen. Finally, I felt inspired enough to try it. But where to start? Living in Los Angeles, I didn’t know at the time…but this is the Mecca of the sport. Every other corner has a jiu jitsu gym. With some of these gyms being legit and some not as much, I set out to try classes and see for myself. After trying a few in my area, I met a person who later turned out to be an MMA fighter who trained under Alder Hampel. Alder, or I know him now as “Coach,” was a Jiu Jitsu Brown belt under Eddie Bravo in the 10th Planet Jiu Jitsu System at the time. The MMA fighter encouraged me to take a class and try it. It almost seemed like fate because the gym they had just moved to had opened that week. 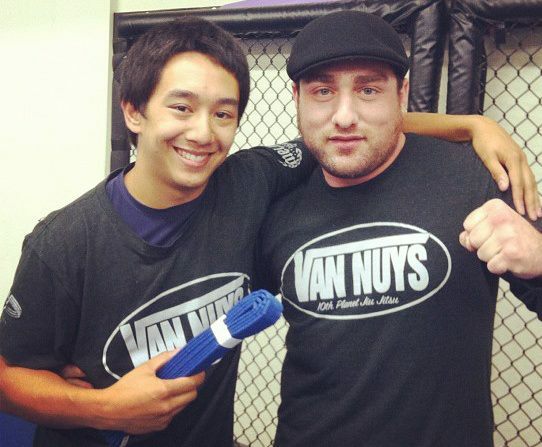 The gym I attended that Sunday was 10th Planet Van Nuys. Again, in my drive to practice everyday, I pass tons of gyms of different martial arts. What was different about 10PVN was the atmosphere, team vibe, and instruction. Since starting about fives years ago I’ve learned a lot about the sport, myself, and life in general. I have had the pleasure of training with world class athletes, visiting tons of gyms and seeing talent everywhere, and so much more. I started the program and currently am the Head MMA Instructor at 10th Planet Van Nuys now cornering plenty on the rise fighters. In addition, I teach Fundamentals BJJ Classes and occasionally, some of the Advanced Classes as well. I’m currently a Purple Belt under Alder Hampel in 10th Planet Jiu Jitsu now and am working towards my Brown Belt. Check back on the blog often and see all the techniques, reviews, and more that I’ll be posting up often!